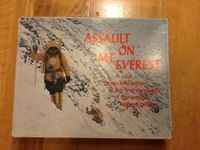 I have an unpunched edition of Assault on Mt Everest for sale. 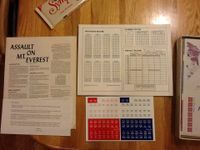 This will be listed with a starting bid of $150 and will have a soft reserve. My definition of soft reserve is that this is the minimum dollar figure that I can guarantee a sale. If the ending bid is below this figure, I may still sell it, but that will be a "game time decision". Shipping is from 48236 and will be paid by the winner, and I will ship via whatever method you request. If we (meaning me and the buyer) use USPS I will require Delivery Confirmation on the package. This is to protect both you and I so we can guarantee both that the games have been sent, and that you received them. Local pick up is fine with me. International bidders are welcome to join, just remember that you will be paying the shipping. This particular auction will run until sometime in the evening of November 8th, 2013. I have a set end time for the listings, but I want to discourage sniping.